(18008) with Cheddar being just 11 miles away the lead time from plant, to punnet, to plate is minimal which is shown in the delicious freshness of the Strawberries you will receive. If you specifically require Cheddar Strawberries please state this as we are also stocking Spanish/Dutch Strawberries to help with supply. Fantastic Chilean Peaches and Nectarines are a great spring fruit to add to the menu. From India we have our new season Green Grape, you will find that the berries are slightly smaller. Beautiful Cavolo Nero (Black Cabbage) is proving very popular. Our lovely Jersey Royals will become more readily available as the season matures this will also affect the price. 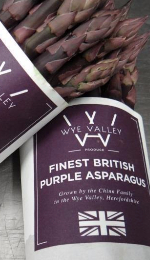 Green (1024) and Purple (387) Wye Valley Asparagus is proving a great seller and it is not hard to see why, this is a divine, truly seasonal line. 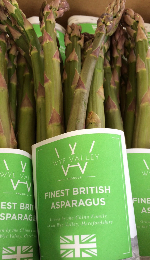 Also from Wye Valley we have fantastic Rhubarb (31223). 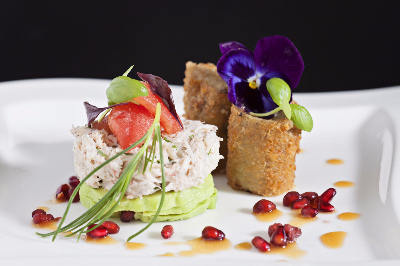 What’s not to love about the beautiful colour and taste! There is currently a really good supply of Hispi Cabbage coming from Spain and Portugal, well worth a try this week! Not only do we have superb English Turnips, we also have locally grown Swede from Somerset. Did you know Swede is actually part of the cabbage family? It is often mistake for being part of the Turnip family due to its shape and colour. We have some fantastic UK grown Baby Spinach in stock and available by the 200g bag. Wild Garlic back in stock, it’s sourced locally and picked daily! This time of year is prime Wild Garlic season and it should be available until the middle of May! Although we are only supplying the Wild Garlic leaves in actual fact all parts of the plant (bulb, leaves and flowers) are edible. As the name implies, Wild Garlic has a distinctive flavour of garlic though not as heavy or pungent. keep your eyes peeled! We have already seen the first Dutch Cucumbers, Aubergines, Yellow, Green and Orange Peppers. We are considering a move from Lovers to a variety of Potato called ‘Just Enjoy’, we are finding that there are a number of quality issues. There is currently a short supply of Broccoli so we strongly recommend our outstanding Purple Sprouting!